A fresh crunchy salad doesn’t always have to be on the side, it can be the star of its own meal! 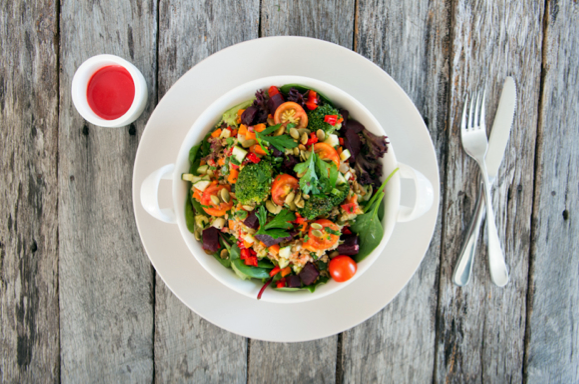 Eat Fit Food’s Quinoa, beetroot & broccoli salad with sultanas, pepitas and raspberry dressing is delicious as a main meal or an accompaniment. This light-but-hearty summery salad is absolutely delicious and the flavours go so well together. BEETROOT is a delicious root vegetable that will support our body’s detoxification process. Beetroot is also high in iron (who knew!) which will boost your energy levels and help fight fatigue. SWEET POTATO is high in Vitamin B6, is a good source of Vitamin C and Vitamin D, as well as iron and magnesium - the relaxation/anti stress mineral. 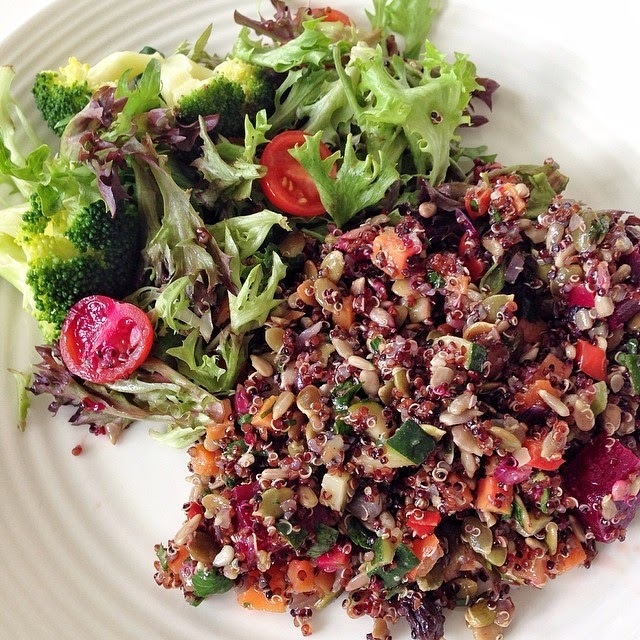 QUINOA (pronounced keen-wah) is notorious for its health benefits and is possibly THEE superfood. Its nutty texture is an awesome gluten free option which is high in protein (are you listening vegetarians? ), iron, fibre and low in fat. Make sure you rinse it well in a fine sieve before cooking (Quinoa has a natural bitter coating of saponins, which dissolve when quinoa is rinsed) and be adventurous with the different varieties and colours. Use Quinoa in salads, stuffings and anywhere you’d use rice or pasta. I even have it for breakfast with fresh fruit (pear and passionfruit is GOOD), some walnuts and a small dollop of coconut yoghurt. Dice beetroot, cook at 180°C for roughly 30 minutes. Dice sweet potato, cook at 180°C for 15 minutes. Steam broccoli in small florets for 2 minutes. Cook walnuts and seeds for 5 mins in oven 180°C. Chop onion, carrot and capsicum. Mixed the quinoa and parsley together with salt and pepper to taste. Arrange as you wish on your plate and ENJOY! It's good, people. IT'S GOOD. PS There are so SO many new Table Tonic products to tell you about. Watch this space (or just click here).